Collected news articles and letters about the library display and subsequent controversy. This binder resides proudly on my desk to this day. In June of 2005, as a graduate student at my very first library job, I created a display for Gay and Lesbian Pride Month. I knew the display could generate controversy but after consulting with my supervisor, the display went up in a prominent location, right inside the West Gate Regional Library’s front doors. 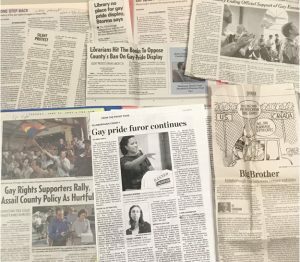 After three complaints, Hillsborough County’s chief librarian decided to remove the display; soon after the Hillsborough County Commission approved a policy directing county government to “abstain from acknowledging, promoting or participating” in gay pride events. This was my first experience with good trouble, and with the challenges librarians face as we promote equal access and recognition for the diverse communities we serve. Thirteen years later, as I begin my first year of service on ALSC’s Intellectual Freedom Committee, I reflect on my personal experience and turn to the pages of books and journals that show the history of librarianship and intellectual freedom. Sometimes we need motivation to keep intellectual freedom at the forefront of our work as librarians. After all, our work on this issue doesn’t just concern complaints and threats to the freedom to read, it also requires self-reflection to avoid self-censorship, particularly in terms of collection development. The more I read, the more awed I am by the work of librarians before me, and the more inspired I am to continue to do my best to uphold one of the core values of librarianship. For several years, the October edition of the Wilson Library Bulletin “explored significant concerns in the area of library work for children”. 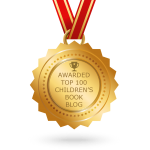 In 1976, the focus of the discussion was intellectual freedom for children. This post addresses the following ALSC Core Competency: V. Outreach and Advocacy. 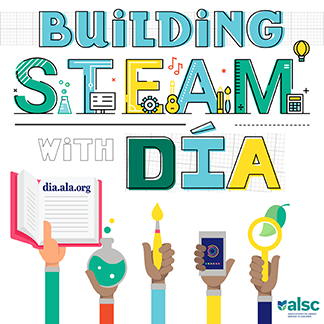 Our guest blogger today is Meagan Albright, member of the ALSC IF Committee. Meagan is a Youth Services Librarian III at the Nova Southeastern University Alvin Sherman Library, Research and Information Technology Center in Fort Lauderdale, FL. You can reach her at ameagan@nova.edu. 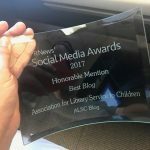 Please note that as a guest post, the views expressed here do not represent the official position of ALA or ALSC. Carson, D. M. (1962). Price of liberty. Wilson Library Bulletin, 36392-393. Holan, Mark. (2005, June 16). Commission Bans County From Recognizing Gay Pride. Tampa Tribune. Knox, Emily J. M. (2017). Opposing Censorship in Difficult Times. Library Quarterly, 87(3), 268-276. Lewis, John. (May 2016). Commencement Address. Speech presented at Bates College. Lewiston, Maine. McLeod, R. (1969). Dissent and reaction in Missouri. Wilson Library Bulletin, 44269-276. Procuniar, P. E. (1976). Intellectual rights of children. Wilson Library Bulletin, 51163-167. Sullivan, Peggy (1976) Freedom and constraint in children’s literature. Wilson Library Bulletin, 51144-176.